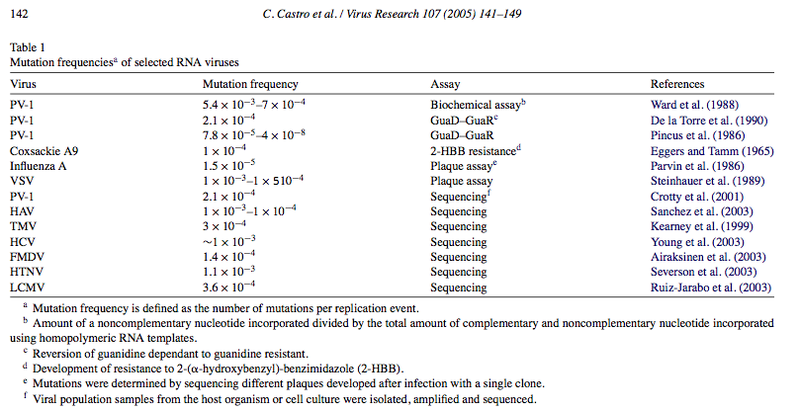 I’ve talked about quasispecies several times, and emphasized that RNA viruses, with their high replication error rates, are most prone to forming quasispecies. So maybe DNA viruses might actually form quasispecies, and we don’t know it? In other words, the standard methods of maintaining a virus — repeatedly growing new stocks in cells, and using those new stocks to make yet more — allow the accumulation of variations in the genome — which is already well known, of course, but often neglected in lab experiments. Again, as I point out above, the number of observed mutations we see here doesn’t tell us much about the actual mutation frequency. (My emphasis) For comparison, the MCMV genome is not quite 250,000 bp long, so we’re looking at around one mutation per 40-50 genomes per day (if I’m dividing right). That’s hundreds of times more stable than most RNA viruses (see the table here3 for some RNA virus error rates). Still, there’s plenty of room for natural selection in there, because of course there are hundreds or thousands of new MCMV genomes being made per day even in the most conservative estimate (and maybe more like millions or hundreds of millions), so dozens to thousands of them are mutants. So, not surprisingly, Yokoyama’s group was able to detect a cluster of mutations that were almost certainly selected in the mouse; without going into detail, these mutations were in a viral gene (m157) that’s known to be recognized by the (laboratory) mouse immune system, so it wasn’t surprising that mutants were selected. And such mutants did not appear in mice without the appropriate immune component, demonstrating the role of natural selection in this cluster. Still, the results are solid and reassuring, supporting a basic concept in viral evolution.